Stir together the flour and salt. Combine eggs and milk; stir into the flour mixture. Pour the batter into the Spätzle Hex and place it on the lip of a large saucepan or pot (with a diameter of at least 20 cm or 8 in) of boiling, salted water. Take care to let the extruded pieces of dough (the Spätzle) fall into the slightly bubbling water and let them cook for approximately 2-3 minutes. Generally, Spätzle swimming on the surface are sufficiently cooked and may be gathered with a large slotted spoon, drained and placed into a serving dish. 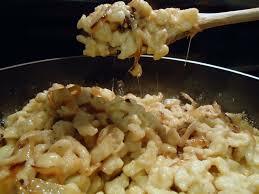 Stir in some melted butter or margarine to keep the Spätzle from sticking together and garnish with some bread crumbs. Makes about 4 cups of Spätzle, which is sufficient as a side dish for 2-3 people. Serve with nearly any meat dish. Spätzle is great with gravy, sauces or just plain.